You can read the whole thing online for free. 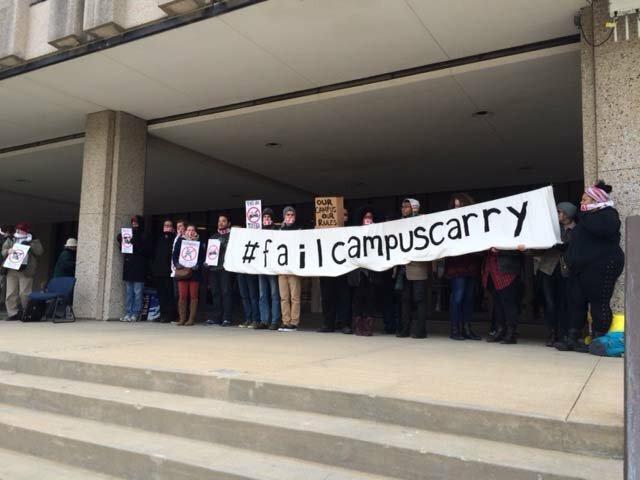 Above, protestors rally on KU’s Wescoe Beach to prevent the carrying of guns on campus. And you know what would be totally awesome? If you are thankful for this work, support it with a direct donation to students and graduates working for gun-free campuses. They’re supposed to be studying–and paying to do it–and they are also doing the work of fighting against armed campuses. If you need some suggestions on how to do that, please let me know and I’ll help you find a student you can support. Next Next post: Women deserve more than crumbs from Congress.